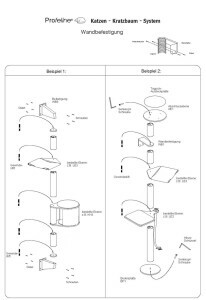 1 and 2 trunk systems: these are our free-standing scratching trees, available with or without a cat house – please pay attention to their height when putting them together yourself. Scratching trees affixed to the wall: you need a drill. Our scratching tree system comprises individual posts and levels connected with threaded rods. 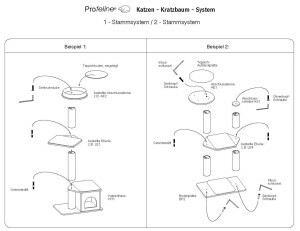 KH1, KH2 and KH4 cat houses, our flat surfaces for your cat to lie on and wall fixings will be delivered ready for use – no assembly kit needed. Advantage: our cat houses come ready to use, so you are guaranteed that your scratching tree won’t fall down or slide on the floor, so lively or big, heavy cats can climb, play, and scratch. NB: we supply cat houses, including the sisal scratching post, fully assembled – no assembly kit – which guarantees expert workmanship and stability. 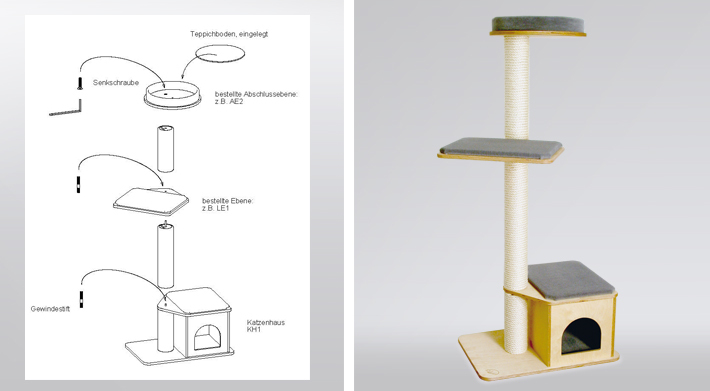 This means the cat house can be used straight away, and it is quick and easy to complete the assembly of the scratching tree (approx. 10 mins). 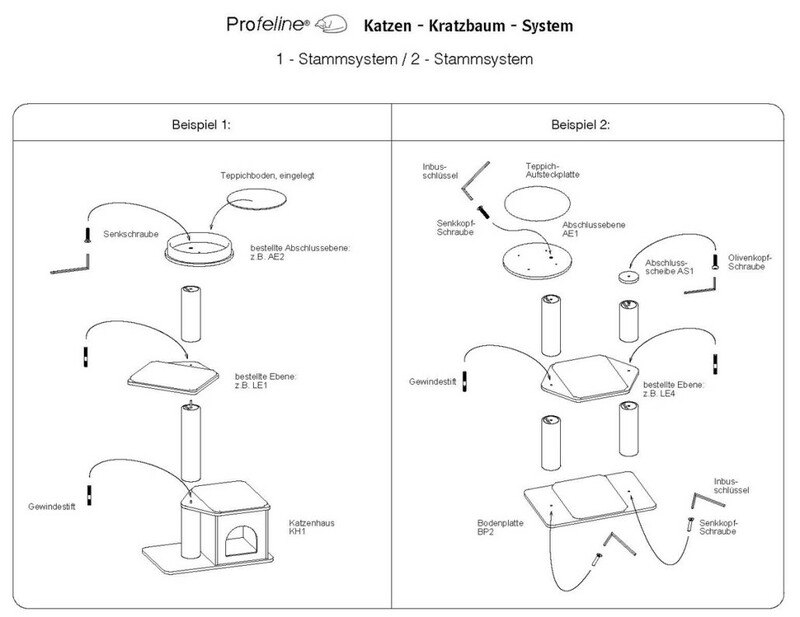 The 1 and 2-post scratching tree system always includes a cat house that is individually built on to. NB: Our 1-post scratching tree can be built on to up to a total height of approx. 170 cm. A total height of approx. 190 cm applies to our 2-post scratching tree, dependent on the model. The advantage for you: Our construction method guarantees that your scratching tree won’t fall or slip on the floor – so even the most lively, biggest and heaviest cats can climb, play and scratch. We supply our cat houses fully assembled – no assembly kit needed. 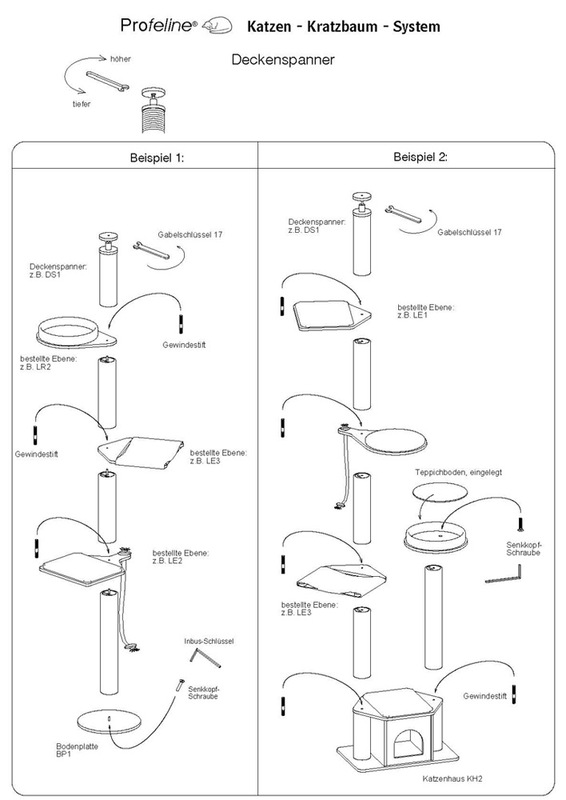 Please note: For cat trees you put together yourself, you must use a wall fixing to affix the post. 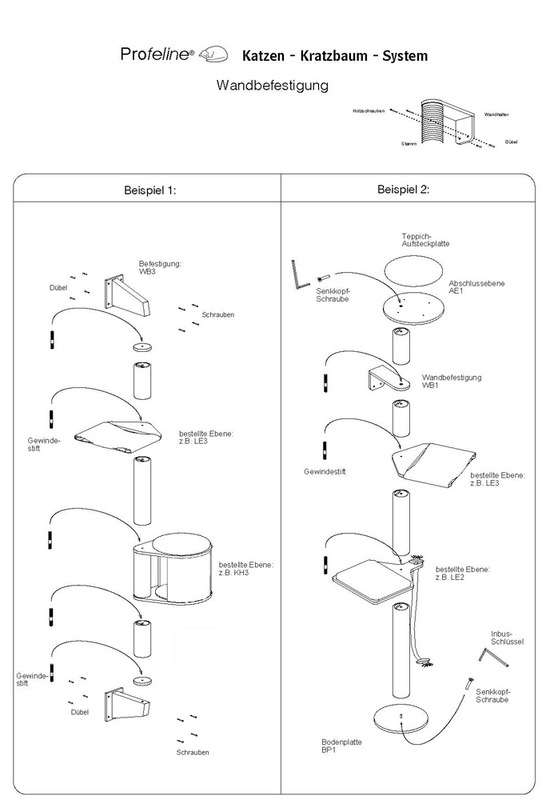 Ceiling-tensioned or ceiling-high scratching trees are tensioned between floor and ceiling (no drill needed). Tip: Ceiling-mounted scratching trees are absolutely stable and cannot tip over. NB: The tensioner against the ceiling puts pressure against the ceiling. The ceiling must therefore be stable enough to withhold this. Suspended ceilings are not suitable. All our cat scratching trees that are tensioned from the ceiling are also available for other ceiling heights. Scratching trees that are affixed to the wall and wall scratching trees need a suitably stable wall for secure assembly. Hollow room walls are only suitable for wall fixings. 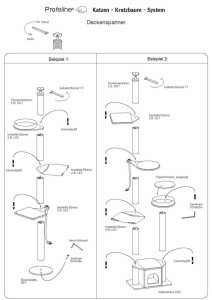 Please use wall plugs designed for hollow walls – our assembly set contains universal wall plugs.